Messier 85 (M85) is a lenticular or elliptical galaxy located in the Virgo Cluster of galaxies, in the constellation Coma Berenices. The galaxy lies at an approximate distance of 60 million light years from Earth and has an apparent magnitude of 10. It has the designation NGC 4382 in the New General Catalogue. Messier 85 is about 125,000 light years across and occupies an area of 7.1 by 5.5 arc minutes of apparent sky. 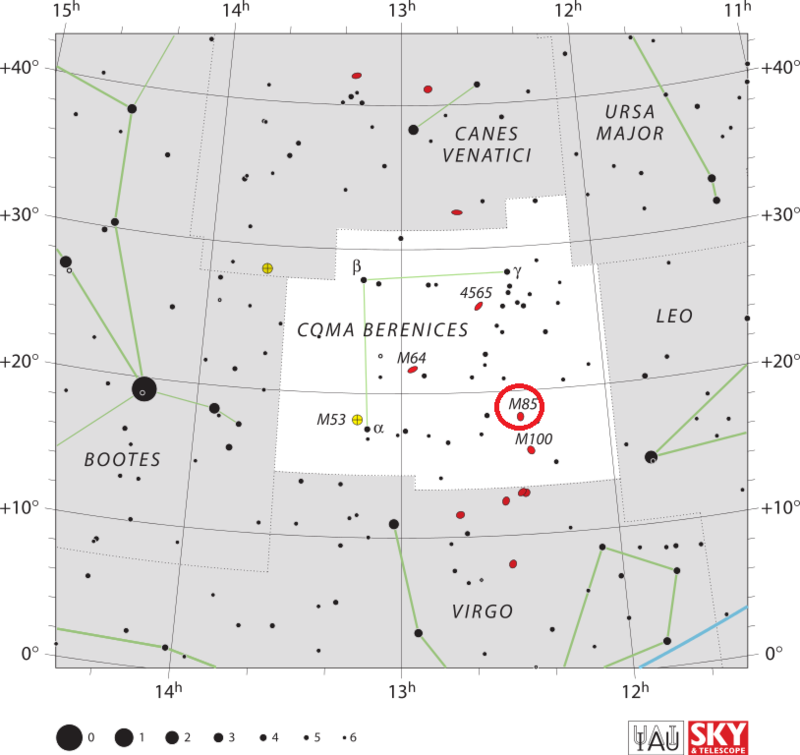 It is the northernmost member of the Virgo Cluster listed in Messier’s catalogue. The galaxy is relatively faint and not easy to spot in 10×50 binoculars. Small telescopes will show only a fuzzy ball of light with a bright centre. 6-inch and 8-inch telescopes reveal a bright, round patch of light with a significantly brighter core. However, even larger instruments do not reveal much more detail. The galaxy lies at the northern edge of the Virgo Cluster, whose centre can be found roughly halfway between the bright stars Denebola in Leo and Vindemiatrix in Virgo constellation. 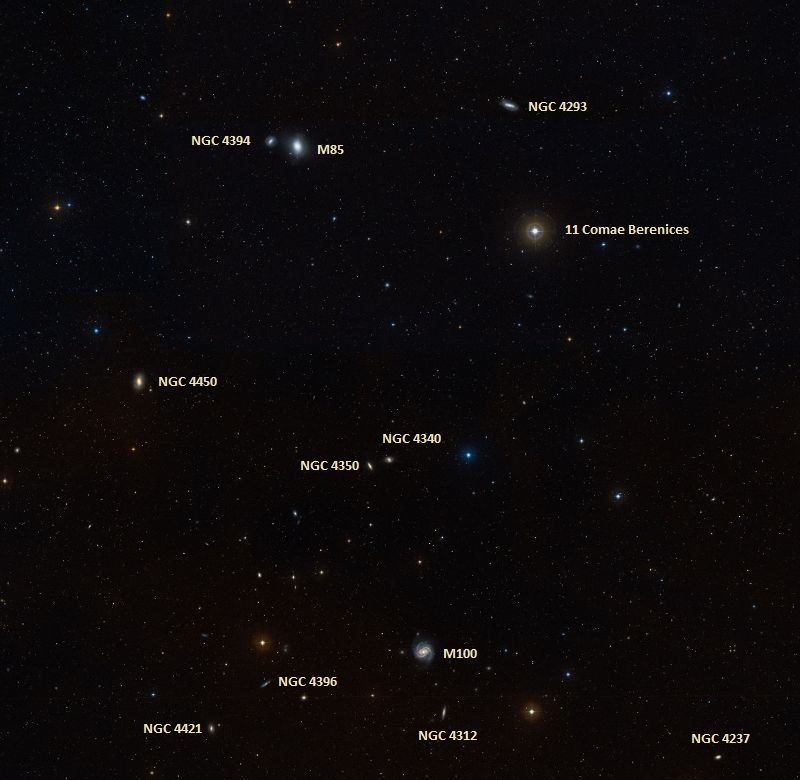 M85 is located about 6 degrees to the northwest of the cluster’s centre. It can be found 1 degree northeast of the magnitude 4.7 star 11 Comae Berenices. The best time of year to observe M85 is during the spring. Messier 85 is either a luminous lenticular galaxy or an elliptical galaxy. 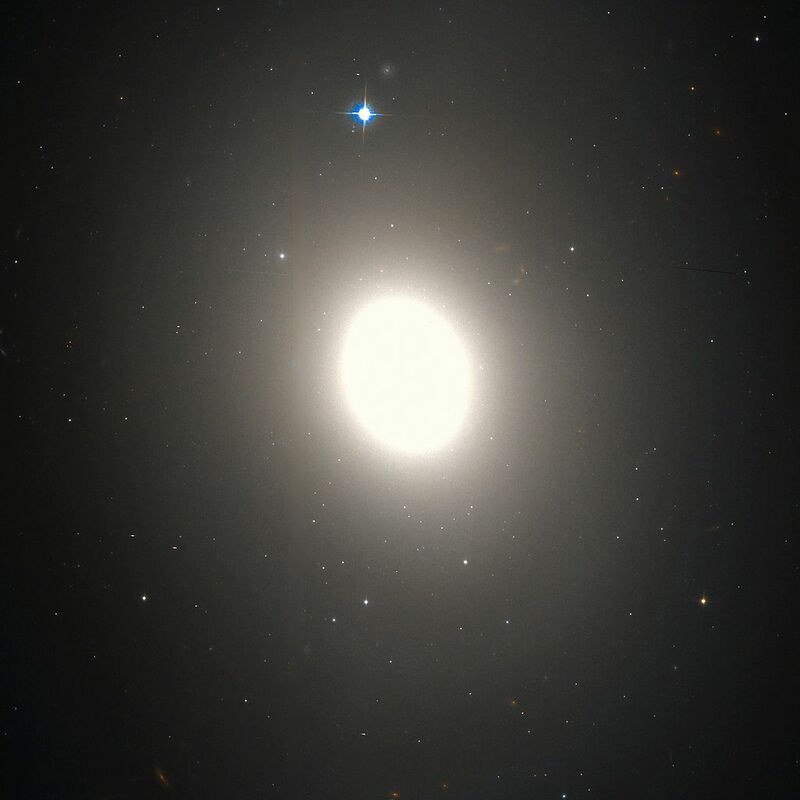 It was long believed to be a lenticular galaxy of type S0, but recent studies indicate that it may in fact be an elliptical galaxy of type E1. M85 is similar to M84, another member of the Virgo Cluster, in size and brightness. 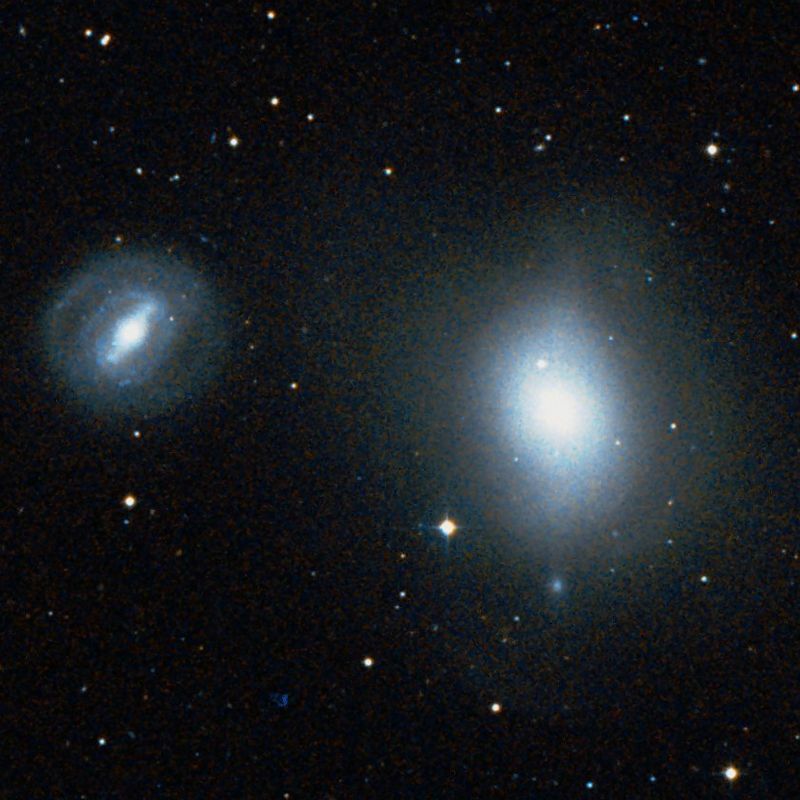 Messier 85 is interacting with two neighbouring galaxies: the spiral galaxy NGC 4394 and the elliptical galaxy MCG 3-32-38. Messier 85 has a smaller neighbour about 8 arc minutes to the east. The barred spiral galaxy NGC 4394, which is receding from us at the same velocity as M85 – about 700 km/s – has a visual magnitude of 11.2 The two galaxies are suspected to form a physical pair. M85 itself is moving away from us at about 729 km/s. Messier 85 has very little neutral hydrogen and its outer structure indicates that it underwent a merger with another galaxy about 4 to 7 billion years ago. The stars in the galaxy are mostly old. The central region is home to relatively young stars, under 3 billion years old, some of them arranged in a ring. These stars are believed to have formed in a late burst of star forming activity. Some studies indicate that the core of Messier 85 contains a supermassive black hole with an estimated mass of 100 million solar masses, or 25 times more massive than the one at the centre of the Milky Way. However, results of velocity dispersion observations suggest that M85 may not have a central massive black hole at all. A supernova, designated SN 1960R, was seen in M85 on December 20, 1960. It was classified as Type I and reached a peak magnitude of 11.7. The supernova is sometimes confused for a star lying in the foreground of M85, northeast of the galaxy’s centre. The first ever luminous red nova (LRN) identified as such was observed in M85 on January 7, 2006. The nova, designated as M85 OT2006-1, occurred on the outskirts of the galaxy. Luminous red novae occur when two stars collide and are significantly more luminous than regular novae, but not as bright as Type Ia supernovae. They are characterised by a red colour. Other known luminous red novae include V838 Monocerotis in the constellation Monoceros, V4332 Sagittarii in Sagittarius, and M31 RV in the Andromeda Galaxy (M31) in the constellation Andromeda. The M85 galaxy was discovered by the French astronomer Pierre Méchain on March 4, 1781. He reported the discovery to his friend Charles Messier, who determined the position for the object and included it in his catalogue of deep sky objects on March 18, 1781. On the same night, Messier discovered seven other members of the Virgo Cluster – Messier 84, Messier 86, Messier 87 (Virgo A), Messier 88, Messier 89, Messier 90 and Messier 91 – as well as the globular cluster Messier 92, located in Hercules.